In my quest to convert more readers of my blog to engaged subscribers, I am running a lot of experiments. This one was one of the high impact ones – basically doubling my new daily subscribers. This will go away after the reader views 3 pages of my blog. So the signup can happen right then and there – with no additional page to lower the conversion rate. And that’s it – clean and simple, and with very nice results. To show the link to new visitors only, I used the What Would Seth Godin Do wordpress plugin – which simply uses a cookie to separate new visitors from existing readers – and only show the message to new readers. The plugin is pretty simple – it allows you to add a custom message before or after the article, and not much more. For the Two Step Optin, I used a Lead Link – from Leadpages. Using Leadpages – which is a paid product – was easier for me as it enables you to do this out of the box, but it’s definitely not a requirement. On to the results – before starting this experiment, I was getting about 13 new email subscribers / day. Out of the total number of new visitors in the test period – 9633 – ~58.66% were new (and actually saw the optin). And, out of these 5650 new visitors – 126 clicked on the CTA – that is a ~2.4% conversion rate. Now – out of these 126 impressions of the popup Optin form – 109 actually opted in – which is an 87% conversion rate on the Optin itself – not bad. 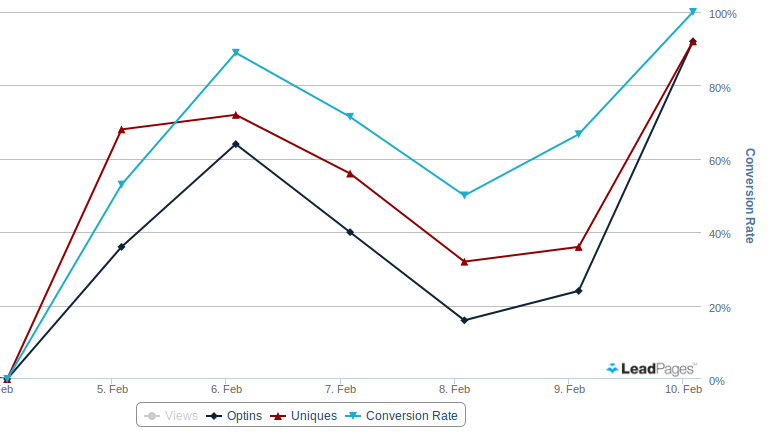 Overall, the conversion rate is 1.93% – which is higher than my main sidebar conversion rate. Finally – over the course of 8 days – 109 new subscribers means an average of just over 13 new subscribers / day – thus, doubling the rate with which I’m building my list. The conclusion is straightforward – this is an easy strategy to implement and the results are huge. If you’d like to keep abreast with my upcoming experiments and get high impact strategies like this one – opt into my email list (on your right). “opt into my email list (on your right).” had me confused until I scrolled all the way up. BTW: You should also challenge a couple of techniques employed on this very interesting blog here: http://www.groovehq.com/blog. They’re doing things quite well to get subscriber conversion! Hey Lukas – yeah, I’ve been following them since they started – some great lessons in there and quite inspiring to see how to grow. It’s especially interesting given that they recently had a bit of trouble – to see that – yes, that can and probably will happen, and – while it’s bad, it’s not “loose your business” bad. So thanks for that – I am planning to try out some of their suggestions, as well as a host of other experiments I have lined up. Great, looking forward to that!